How to boost sales and make more money in 2015 ~ Guaranteed! 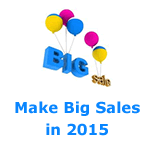 →How to boost sales and make more money in 2015 ~ Guaranteed! 2015 is here and we all want everything this year to be better. We want more clients, more connections, more sales and more profit. But what do we do in order to boost sales? You must have read about making resolutions and trying to be better this year. Some say we have to expand our business spheres – do more investment, upgrade staff strength, etc. However, there is something I want to share with you that will surely boost your sales whether you are doing online or offline business. It works great anywhere and I’m so sure you are not new to it. However, I don’t think many of us have thought of integrating this into our growth strategies to make more sales this year. The reason behind this post is to remind you of something that works great and encourage you to do it often for more sales and profit. Everyone in business can do this and there is almost 100% chances to see an increase in sales. Now this is not from theoretical knowledge. I have experienced this even on this blog and I shall be sharing some examples. People don’t just walk into a nearby store and buy. They won’t just click your offers and pull out their credit cards. People want value for every thing they buy online or offline. This says one thing – the more value you add to your product or service, the more sales you stand to make. There is no doubt your product/service has a packaged value that’s so great for the tagged price. But I want to assure you if you add a little more value to that which you offer, that will attract more sales -> more value added, more sales attracted. So how do I add more value to my product or service for more sales this year Enstine? Add bonuses = boost sales! That’s just it. It works like charm. The more free stuff you add to your product, the more you make sales. But there is a way to do it to incredibly increase says. Let’s discuss! Bonuses are related products you give out freely to anyone that chooses to buy from you. That’s just it. From my years of experience, many people buy stuffs just to access the bonuses. Yes that’s right and I do that too! Now if your product is $17, a bonus worth $47 will do the magic. People will scramble to buy your $17 product to access the bonus that has a bigger value. That means just by spending $17, they have $64 worth of product. However, for this to work, your bonuses must be closely related and compliment the product or something very useful to your target audience. Excuse #1: I don’t have anything to offer as bonuses Enstine! 1 – Offer your own product! This is most powerful! If you have one product in the market, you can just offer it free to your audience if they buy the other product. That’s as easy as that. Do you have an ebook, a software, etc? Your readers will be happy to grab a free copy should they buy from you. Private Label Rights products are common today. That means you can just buy a product and rebrand it, resell or give it for free. It may cause you some money to purchase these PLR products but the simple truth is this can go a long way to boost your sales. You see why it’s no excuse to say you don’t have any thing to offer as bonuses? You are just sitting down and your flimsy excuses are dragging you and your business to the mud. One beautiful thing with PLR products is that they are quite cheap. That doesn’t mean they are low in quality. The reason behind their cheapness is that they are aimed at mass sales. With $5 or less, you can have exceptional PLR products that can help you boost your sales beyond limit. I feel like just kicking you right now for taking this as an excuse! If you don’t have a product/service, someone else has. All you have to do is promote his/her and get paid commissions. It’s called Affiliate Marketing. It’s one of the best ways to make money online. Offer free copies of the PLR products to your audience should they buy any product you promote using your affiliate link. Here is how I boost my sales – Case Study! As a product creator, I have made a lot of sales online offering free copies and gift. I started with my first site EasyRetweet.com where I offered free credits to members who used my link to buy any affiliate product. My audience buying the premium post (to be able to build their blogs to $5000/m) need traffic. Yes they do and that’s why the BroadedNet credits is a hot bonus. So in conclusion, if you want to boost sales in 2015, add free bonuses to whatever you sell. This is a pretty Good strategy, People Like to have something extra for free after they buy anything despite the cost, in Nigeria, they call it “Jara”. And I only notice that it’s Only the Businesses that give this “Jara” or Bonus, that does best at selling their products and services. I’ll be looking forward to see how I can apply this tip in transactions that I do. Thanks Mr. Enstine 🙂 Have a wonderful week. Hahaha I like that word “Jara” like the Jara program on African Magic right? Each time I visit your blog, I always have something special to go home with. This is a beautiful Idea. There is no doubt these will bring more sales. Everyone wants more value for their hard earned money. I will need to create eBooks so that I can have something of my own to offer. That’s certainly a beautiful step to take. Don’t just seat and expect. Act in expectation. In affiliate marketing, offering free stuffs as bonus as been one of the most effective strategies to increase affiliate commission. I have seen big time marketers such as John Chow doing this time and time again. It works and am just thinking about how I can implement this strategy with one of my affiliate offer. Thanks for the reminder, have a great day. That’s right Shamsudeen! John is doing that a lot and I have personally seen success with it. You just need to have a hot product to attache to whatever you promote. Free offers always adds value, especially if the offer is targeted and on niche. Love the way you have complimented BroadedNet credits with other products of yours. BroadedNet is a huge success, I have seen how people are jumping for it on the campaign we are running on GuestCrew. Very correct Sen! If the offer adds more value, it becomes more attractive. Hey pal, I must say that these are some awesome tips to boost or double our earnings. All we have to do is find what works for our blog and capitalize on it. Thanks very much for the awesome tips. That’s right buddy. Focusing on an over, rinse and repeat will always generate positive results. Nice sales tips- they really rock. You are right that the best way to boost sales is to offer incentives and there are many things to sell and many ways to make money so we have no excuse. THANKS FOR SHARING. Thanks for coming on today 😉 Great comment! I replied to the mails. didn’t you get the replies? I really love bonus stuffs. It’s not only me almost all the people love bonus or free stuffs. Providing free stuff with a paid product can insanely increase sells. I think I need to apply this trick with my future products. Thanks for the amazing idea. Although it need more effort, hope the outcome will be worthy of the given effort. Really it’s an interesting post. Selling product with bonus it’s a good idea. People can interested to buy the product if they get extra. Thanks to share these methods. These are nice and useful ways to promote our sale. Yes by giving a free bonus , more people will be attracted and you sale will automatically increase. Thanks for sharing these ways. Can you imagine that I’ve never thought of adding bonuses to the products i sell. I will now try it out to see the charm you’re talking about. Who doesn’t like free things (bonuses)? And when you add a very useful product/service as the bonus, you will definitely boost sales. This reminds of the post on my blog titled “Make Money Online Giving People Free Things”. It contains things you can give to people online for free and still make more money. Strange I didn’t read that post on your blog bro. That was really a great post to let a blogger know how he can actually make money online without using any ad network. When my AdSense got banned, I was completely disappointed and thought to quit blogging. Later on I got to know that there are thousands new ways to make money online. This post is such an inspiring article for those who are facing problems in earning money online. Gonna share this with my fellow bloggers for sure. Sorry to hear about your Adsense Account man. That’s what Google can do to crumble people’s businesses. Luckily enough, there are other ways to make money online. thanks alot for this wonderful post. I just wanted to remind you that I bought your premium post, but am yet to receive my 1000 credits on BroadedNet. Please help! Just don’t forget about having an email list. content as well as discounts to increase your sale(s). online, then watch our short video. However, it’s time to make thing more ‘free’ again! How can you not find ways to make money online. There’s so many opportunities out there that it’s inevitable. The problem with most people is figuring out how to go about doing it! Your idea of adding free bonuses is ingenious! Yes, I too admit that I purchase products/services for the free bonuses sometimes. This is where it becomes much valuable. We all want to get our money’s worth, and if you over-deliver with your products or services, then that says a lot about you and how successful you’ll become! Thanks for the share Enstine! Have a great one! I’ve never ventured into selling products on my site before, but I know it’s something I need to do to start earning proper money. I was aware of the methods that you discussed, but didn’t bother to look deeper as it seemed so complicated. But you explained things well, and I will have to look into it more. I’m currently trying to change the general direction of my blog, but once I’ve got that clear, I’ll start creating and selling products. Put things in order and see the way forward. I’m sure 2015 has a better package for us. There is always a way for you to increase sales. It was impressive! By the way, in this article you mention that for those who buy your premium post, then he will get 1000 credits in BroadedNet. Credits on BroadedNet don’t expire but this offer will soon be taken off. So what I recommend you do now is grab the offer and create your free account. I’ll get the credits into it so you can use anytime you are ready. thanks alot for this awesome post. The word “Guaranteed” forced me to check what you have written in the post. These days I am analyzing many blogs and studying how they are making money online. With my surprise more than 95% have their own products. Some bloggers have gone at another level by selling PLR product very smartly. The tips you shared are 100% valid if anyone seriously wants to make money online. I am on your blog after a long time, but I loved what you taught here. Good to see you here bro and thanks for the comment and feedback. Yes it’s quite easier to make money by selling your own stuff especially if your are known. The PLR industry is making it possible for many to own products they can set their prices and sell. Do you have any products in the market? Yeah, PLR industry is growing at such a rapid rate.. I am launching my product very soon. It’s a WordPress plugin. Thanks for sharing such powerful method. Using free product to attract visitors works well, and I have even see it works especially if it is a product written by the same person. But people don’t really want to waste their precious time writing report when then can download a PLR product for just a few bucks and make many times the money back if they really know how to do it. Sometimes (often times actually) I am astounded at how simple you make things for those looking to earn money – and yet within the simplicity is pure brilliance!! People love bonuses and bargains! Just the other day I bought two tubes of toothpaste because it was $6 for both, though $4 if I just bought one. The bonus aspect grabbed my attention and motivated my buying decision. Your instructions in this post are easy and doable for anyone..and the bonus you slipped in has me already clicking over to your premium post!! Great job as always Enstine!! People love discounts, freebies, promotions. They help decide whether to make the purchase or not. You gave me some great ideas, thanks my friend. Keep up the fantastic job here. Hello Enstine, What a great post my friend! So very true everyone Loves something for free so of course this just makes sense. I felt as though you were talking right to me , stop making excuses LOL “”Getter Done Chery”” Right? I don’t have my own product and do life the sounds of these PLR products. Now that I think about this I may have one or even two already branded to me here on my computer somewhere. Although this year I have really been leading with the value of team training. I do know for a fact that people need that kick in the pants so to say, so this is what I have been offering, kind of like an accountability team thingy. This is another great post from the guru,2015 is going to be one of the great year to learn more tricks to attract more sales and traffics just by offering and offer for sale i deeply agreed with you. my traffic is also low and have alexa above of 100,000. Is there any way for me to generate traffic from google also? I am newbie and i don’t have really any idea about it. Hope these tips, you’d share will help me a lot in future. Though your ideas for increasing sales are quite bold (and expensive), but still i will try to implement them. thanks for the ideas.